Many students participated in team building, career exploration and job preparedness classes. Several offices held Dress for Success events, hosting fashion shows and teaching students how to best present themselves at job interviews. Touring colleges and universities provided students with information and resources they can utilize as they pursue post secondary education. Employers spoke about what they look for in successful employees. Visits to businesses as diverse as MTU Detroit Diesel (which manufactures Rolls Royce engines) and The Local Buzz (a family owned, kid-friendly coffee cafe) introduced students to a variety of vocations and provided them with behind the scenes looks at careers such as an electromagnetic engineering, farming, veterinarian, and event planning and management. View the slide show below to learn more about how students from around the state spent their summer. Students learn about personal protective equipment and teamwork in a manufacturing environment. Students toured MTU Detroit Diesel, Inc. and learned how Rolls Royce engines that are used in trains and Israeli tanks are manufactured. Front row (left to right): Nechyna Carter, Selena Brannum, Annette Baker, LaShawn Chinn. Back row: Bobby Livingston, James Eubanks, Jonathan Bodiford, Will Cato, Wayne Driggers, Marquis Brooks, Zee Seago, Zakary Simmons. Aiken Summer Institute students learn about the Rolls Royce engines manufactured at MTU Detroit Diesel. Students view and learn about the Rolls Royce Engines that are used in trains and Israeli tanks. These engines are produced at MTU Detroit Diesel, Inc. This student faced her fear of heights on the “Cat Walk” at the Wil Lou Gray Ropes Course. Another student climbed higher than she thought she could at Ropes Course. Students challenged themselves and learned teamwork at the Wil Lou Gray Ropes Course. A student fist bumps Vocational ACE Brittany Jenson after challenging himself on the Ropes Course. Staff walk the runway during a Dress for Success Fashion show. Students rated each staff member for their, appearance, dress and overall presentation. Students point out the fashion faux pas made by a VR staff member during the Dress for Success Fashion Show. Students take a behind the scenes tour of the Lexington County Baseball Stadium. They learned about the variety of jobs at the stadium, what’s involved in hosting a minor league baseball team, and other non-obvious ways the stadium serves the community. After the tour, students had fun meeting Blowie (right), the Lexington Blowfish mascot. Students learn about the day-to-day operation of Pets, Inc.
STEPS students learn about the day-to-day operation of Pets, Inc.
A student who has difficulty communicating verbally types a question on her iPad for the Pets Inc. staff. Students learn about the challenges involved in opening and owning a small business from Stephanie Bridgers, owner of The Local Buzz. Stephanie Bridgers (right), owner of The Local Buzz, teaches students baking techniques and shows how she markets each days baked goods using social media. Students visited City Roots where they toured the three acre farm and learned about field crops, greenhouse microgreens, beekeeping, aquaponics and the variety of career opportunities available on a farm. Left to right: Sade Pugh, Counselor; James Blake; Robbie Radcliff; Kayla Ford, Counselor; Robbie McClam, City Roots Owner/Founder; Jacob Rice; Anthony Scott; Jaheim Gleaton; Timothy Blane Russell, Jr., Truck Driver; Antwan Middleton, Counselor. Students visiting the Richland County Sheriff’s Department learned about career opportunities in law enforcement. Left to right: James Blake; Jaheim Gleaton; Robbie Radcliff; Brittian L. Gadson; Leon Lott, Richland County Sheriff; Anthony Scott; Devaney Johnson; Jacob Rice. Students tour Harvest Hope Food Bank. Students Skylar Norton and Immanuel Martinez participate in a work simulation under th guiadance of Tanya Lambert, Occupational Therapist. Heather Tucker, student engages in a job preparedness activity. Front row (left to right): Erik Hackney; Allen “Trey” Bridwell; Zachary Gibson; Brandon Loncke; Gracie Harris; Hollie Bass; Erica Lewis. Back row: William Hicks; Preston Foster; Xavien Miller; Jameris Shippy, Ray Ruiz; Dyquan Collins; Ward Gray, Physical Therapy Assistant; Tanya Lambert, Occupational Therapist; Jennifer Matthews, Occupational Therapy Intern; Julie Atkins, Area Client Services Manager; Iyonia Simmons, Counselor. Front row (left to right): Rebecca Crichlow; Justin Holland; Jennifer Hawn; Allison Salmen, Occupational Therapy Assistant; Heather Tucker; Arkeem Moore; Tyler Nichols. Middle row: Taylor Lydakis; John Connelly; Deandre Sharpe; Damian Guin; Skylar Norton; Andrew Sanders; Madison Brown; Kadaja Wilson; Tiffany Franklin; Sebastian Kirkland; Iyonia Simmons, Transition Counselor. Back row: Ward Gray, Physical Therapy Assistant; James Jones; Immanuel Martinez; William Nesbitt; Zachary O’Conner; Bryce Mitchell; Jacob Spruill; Julie Atkins, Area Client Services Manager. Students Deshawn Dicks (left) and Tyreek Brunson participate in Dress for Success at Mayo’s Suit City. They are learning how to tie a basic knot, a Half Windsor Knot, and the full Windsor knot. Grant Watson, sales associate at Mayo’s Suit City in Sumter, discusses appropriate colors to wear, how to choose a suit, and when to wear a suit and tie for an interview. Students from three Walterboro high schools challenged themselves at the Wil Lou Gray Ropes Course. 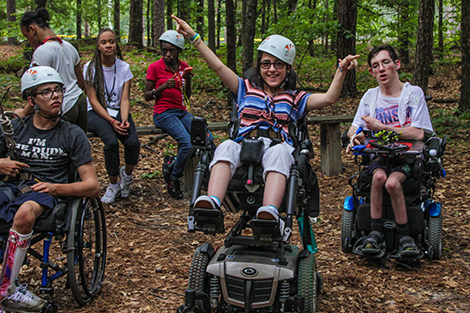 They learned self confidence, how to work together in teams, and supported each other as they accomplished the many challenges of the Ropes Course. Front row (left to right): Faith Thompson; Lynn Marcom, Counselor; Rachel Cope; Jennifer Crabtree; Alyssa Frick; Devante Singletary; Darrell Thomas. Back row: Michael Williams; Messiah Thomas; Antwain Frederick. Darrell Thomas (left) and Messiah Thomas (right) work together on team building and leadership exercises with Mark Ready, Wil Lou Gray Guidance Counselor. Students challenged themselves and encouraged each other as they climbed the 40 foot tower to use the zip line. Students who toured Otis Elevator in Florence were fascinated to learn how elevators are designed, manufactured and installed. Front row (left to right): Savannah Dynan, VR Transition Counselor Xavier Sams, Meronica Williams, Alexus Backus. Back row: OTIS Mechanical Engineer Paula Bryant, Jasmine McCray, Kelleigh Coleman, Mary Smith, Jonathan Strait, Kanisha Cain, Keshawn Milling, D’Airah Hooks, OTIS Industrial Engineer Intern Megan Torbenson, OTIS Executive Administrative Assistant Benzene Shells. ScienceSouth conducted a hands-on electromagnetic engineering activity: building brush bots. High School / High Tech students build brush bots using rubber bands, a AA battery, a nail brush, a small motor, and a glue stick. Students were excited to discover how the brush bot’s construction and weight caused its movement. Students use marshmallows and spaghetti noodles to construct buildings. In this team building STEM (science, technology, engineering and math) activity learned how the different lengths of noodles affected the stability of their buildings. Students touring General Electric saw how MRI machines are constructed and learned how superconducting magnets make these machines economical to operate. Left to right: GE Advanced Manufacturing Engineer Derrick Shaw, GE Process Engineer Jameka Sims, Meronica Williams, Alexus Backus, GE Materials Team Leader Lindsey Odom, Mary Smith, Kar’Nisha Benjamin, Kelleigh Coleman, VR Transition Counselor Xavier Sams, Jasmine McCray, D’Airah Hooks, Kanisha Cain, Jarell Johnson, Keshawn Milling, Christopher Jones, Dillon Transition Coach Melissa Dunson, Jonathan Strait, GE Process Engineer Nehemiah Stephens. Tanisha Hook (left) and Mitchell Harp, both from Trident Technical College (TTC), discuss apprenticeship programs available at TTC. Andrew Bryan, an instructor from Robert Bosch, talks about Bosch’s apprenticeship programs while leading students through hand-on activities. Students learn about apprenticeships at Trident Technical College. Students engage in mock job interviews. Staff members (left to right): Spencer Bobian, VR High School/High Tech Counselor; Laquilla Sirmans, Administrative Team Support Specialist; Christopher Faulk, Vocational Ace.